Pocahontas ("playful one"), whose actual name was Matoaka, was the daughter of Powhatan, chief of a loose confederation of Algonquin tribes inhabiting the area between the James and York rivers in Virginia. 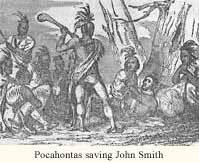 Pocahontas was widely reputed to have saved the life of colonist John Smith when he was threatened by her fellow tribe members in 1607. Many historians doubt this story's authenticity; Smith failed to mention it in his memoirs, but did recount it in a later history. Other authorities have speculated that Smith simply misunderstood the content of an elaborate adoption ceremony. Pocahontas maintained friendly relations with the Jamestown settlers, bringing them food and warning them of an impending attack by her father’s warriors. In 1613, an English official attempted to retrieve settlers imprisoned by Powhatan by luring Pocahontas aboard a ship and holding her hostage. Although she was reputedly the chief’s favorite daughter, he refused to exchange prisoners. Pocahontas remained in captivity, was converted to Christianity, took the name Rebecca and in 1614, with her father’s consent, married colonist John Rolfe. This marriage ushered in an eight-year period of improved relations between the Indians and the colonists. Officials of the Virginia Company seized upon the Pocahontas story and devised an early form of a public relations campaign. The Rolfes, their infant son and several other natives were taken to England as guests of the company. Pocahontas was a sensation; she met many influential English figures and had an audience at the court of James I. The Virginia Company hoped that interest in their colony would be enhanced by their proof that Indians could be "civilized." Pocahontas died in 1617 while preparing to return to Virginia and is buried at Gravesend. Her son Thomas Rolfe was educated in England, but later went to Virginia where he enjoyed great business success and was the forebear of many of the colony's most distinguished families. The death of Pocahontas, followed by her father’s passing the following year, started a steady decline in the relationship between the colonists and the natives. Open warfare broke out in 1622. See also Significant Native American Leaders and Indian Wars Time Table .